Water is an essential element for the sustainable development of Europe. Water is intensively used by different sectors: agriculture, industry and urban. It makes water management, on the one hand, a challenging subject that cannot be tackled by one sector alone, and on the other hand an opportunity for Europe to develop solutions for the water challenges and to establish a leadership position in this domain. In order to be able to address the European water challenges, a strategic approach that develops and brings together appropriate actors has to be established. A joint approach to innovation in water management would enable Europe to create breakthrough for comprehensive solutions and create therefore economic and societal benefits and opportunities for all contributing sectors. The water sector has a key role to play in the development and implementation of sustainable water technologies in and from Europe. The chemical industry also plays an important role in the whole water cycle as being, on one hand, one of the biggest water-consuming industries, and, on the other hand, one of the biggest providers of water treatment materials and technologies. The ChemWater project aims at coordinating European strategies on sustainable materials, processes and emerging technologies development in chemical process and water industry across technology platforms. A core rationale behind the project is to highlight the role of the European chemical and related process industries as solution providers within the context of the complex challenges of industrial – urban - rural water management. This role emphasizes a transformation in perspective which values “chemistry for water” alongside the more traditional notion of “water for chemistry”. Such a perspective allows the project to extend its reach and impact beyond the chemical sector itself to key strategic European process industry sectors such as mining, industrial biotechnology, health, food, electronic, pulp and paper, and energy. Through its strategy and implementation plan, ChemWater will identify key Research and Innovation priorities for Horizon 2020 and support the development of the European Innovation Partnership on Water. The objective of WP2 in the ChemWater project is to identify and analyse potential synergies to be developed between the chemical sector and the water sector to ensure a sustainable use and treatment of water by the chemical industry and beyond. On a challenge-based approach, the contribution of sustainable materials, efficient processes and integrated/symbiotic water management has been considered for the analysis. The chemical industry is a water intensive user for multiple purposes like cleaning, heating/cooling, steam, transport, as raw material, as a solvent, as part of a product. The chemical and refinement industries in Europe are responsible for 50% of all water used by the manufacturing industry and represents 6% of the total freshwater abstracted (see annex 1). The deployment of emerging technologies such as industrial biotechnology or nanotechnology will also have impact of the process and waste water management. The deployment of a sustainable bio-economy and bio-based products will require the integration of sustainable water management. Beyond the most sustainable use of water within chemical plants, the collaboration with other industrial sectors and the urban and rural areas for a symbiotic approach open real opportunities for the sustainable management of water in Europe. Industrial symbiosis is a collaborative enterprise in which by-products of one industry are used as valuable resources by one or several other industries. 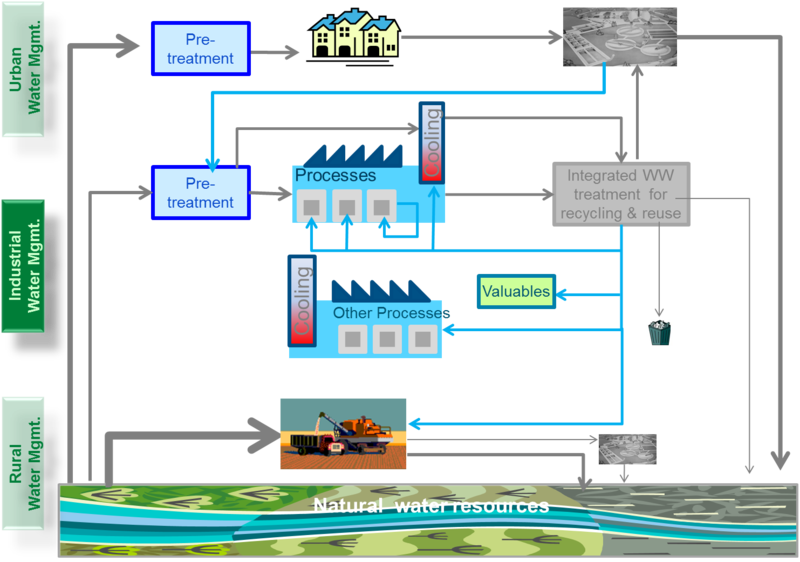 Water symbiosis can become a relevant strategy to improve sustainable water management through the reuse of treated water from other industries -but also other areas by the process industry. 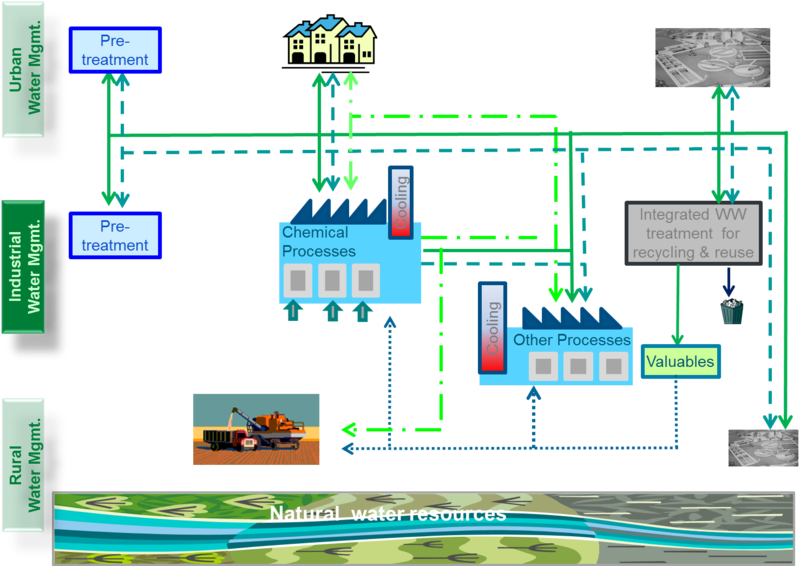 Water streams around chemical production sites in a symbiotic versus standard use of water, as developed jointly by SusChem and WssTP during the preparation phase of the E4Water project, are shown on figure 1. The chemical industry develops new materials, processes and technologies not only for its own sector but also other industrial sectors – both within Europe and for global markets. The chemical sector can play a leading role in providing innovative solutions and bringing a significant contribution towards sustainable water management. As an important water user, but much more as leading supplier of technology and innovative strategies, the European chemical industry will contribute as a key solution provider enabling significant needs to be addressed across value chains that concern the whole water management cycle and paying particular attention to the use of water for industrial purposes. The role of the European chemical sector as solution provider in the complex challenge of industrial, rural and urban water management is illustrated by the main contributions of chemistry–enabled technologies to water management on figure 2. Most of the technologies contributing to water management are based on one or more of the Key Enabling Technologies (advanced materials, advanced manufacturing technologies, nanotechnology, industrial biotechnology, micro/nano-electronics, photonics) as defined by the European Commission (see(COM(2009)512 and COM(2012)341). 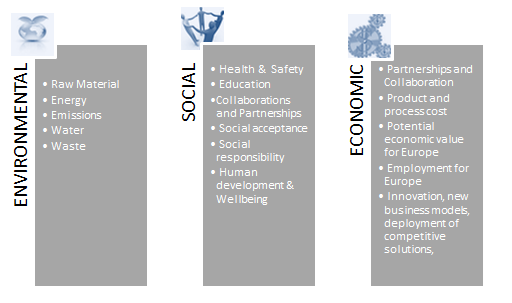 These technologies are at the core of the Industrial Leadership programme of the proposed Horizon 2020 (COM(2011)808)) but will also be supported by the Excellent Science and Societal challenges programmes. These technologies are also at the core of Suschem activities and its technology working groups (Reaction & Process Design (RPD), Materials technology, Industrial Biotechnology (IB)). The development of innovative water-based processing (for photovoltaic or printed electronic) or the deployment of technologies such as industrial biotechnology or nanotechnology can also raise new challenges for sustainable water management although nanotechnology and IB also represent real opportunities for sustainable water management (water treatment technologies, scaling, biofouling, etc). •	Water quality control (e.g. biosensors). Nanotechnology is one of the major technology supported by SusChem through its Materials technology group, and can offer significant contribution to sustainable water management. Due to its unique properties, application of nanotechnology in water treatment has attracted great interests in recent years around the world. At European level, a large number of relevant research activities in the NMP, ENV and KBBE theme has been funded by the European Commission (EC) in the scope of FP7 concerning the application of nanotechnology for water treatment. The contribution of nanotechnologies to sustainable water management has been grouped in the Nano4Water cluster to facilitate dissemination and information exchange. The Nano4water cluster (http://nano4water.eu/) started with six collaborative projects co-funded by the Research DG of the EC following a Joint Call on nanotechnologies for water treatment (FP7-ENV-NMP-2008-2). In 2012, the cluster has expanded to 18 finishing, ongoing and starting FP7 projects dealing with nanotechnologies/nano-products approaches to water treatment. Conventional methods of water treatment are often chemically, energetically and operationally intensive. Further chemical treatments and co-products or waste resulting from treatment (e.g. sludge, toxic waste) can add to the problems of contamination. The large research interest indicates that Nanotechnology for water treatment is an emerging area. To support and guide the introduction of new materials, the technological research is accompanied by Life Cycle Assessment (LCA) approaches to evaluate the potential environmental impacts of specific nano-based applications and to estimate possible nanoparticle release to the environment. The process industry transforms raw material feedstocks to intermediates and end-user products and therefore is at the core of many value chains. Beyond the chemical industry, probably every manufactured product uses water during some part of the production process and or/ use phase. Industrial water use includes water used for such purposes as reaction, processing, washing, diluting, cooling, or transporting a product; incorporating water into a product; or for sanitation needs within the manufacturing facility. But the impact on water goes beyond production. The impact on water use and generation of waste water by-products during their use phase should be considered, and therefore improved product design developed. Beyond the impact of products developed to address specific water related issues (treatment, protection against corrosion, bio-fouling, etc) and the design of processes (cooling technologies, steam, etc. ), the value of industrial waste water have to be considered as well as the design of products enabling limited impact on water during the use phase. Water is one of the resources which has to be considered in the sustainability assessment of any new process (see strategic roadmap of SPIRE, the candidate PPP on Sustainable Process Industry through Resource and energy Efficiency) and product development by the chemical industry, and is therefore considered for the definition of sustainable chemistry by SusChem. A framework for sustainable chemistry applies not only to products themselves, but to the whole product life cycle, from cradle-to-grave or, ideally, cradle-to-cradle. For products, it means full consideration of the impacts of raw material sourcing, manufacture, packaging, transport and distribution, retail, use, and finally recycling or disposal. 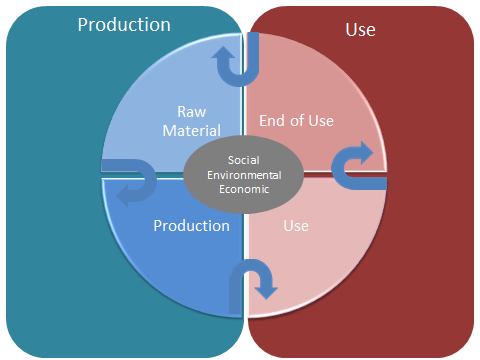 Therefore, SusChem aims to develop a more inclusive definition of sustainable chemistry, embracing the triple bottom line of environmental, social and economic sustainability along the whole value chain and accounting for impacts as well as contributions to societal challenges along the three pillars. •	The specific water-energy nexus since energy is required for water treatment, transport, etc. but energy production accounts for 45% of water abstraction in Europe (EEA- 2010 abstraction figures). Therefore resource efficiency and energy efficiency in the process industry can have a significant –although indirect impact on its water efficiency. This water-energy-resources nexus will be considered in the ChemWater analysis. Beyond the lack of data, some methodological issues related to the integration of water in sustainability assessment could be considered as horizontal challenges during the ChemWater project.